Two-hunter tub provides a low profile. Steve Evert of Beach Haven, N.J., needed a watercraft suitable for hunting the local salt marshes. He found the perfect boat blind, starting with an unused water toy: a two-person pedal boat. "Where we hunt in the salt marshes of New Jersey, there is very little cover for blinds, so maintaining a low profile is the key to effectively hunting puddle ducks, geese and brant," Evert said. "Most of the salt marshes are owned by the state or federal government, so permanent blinds or pit blinds are not permitted." For many years, Evert and his hunting pals used pond boxes, which are relatively heavy fiberglass or wooden low-profile floating blinds made of wood or fiberglass. Other hunters use sneak boxes effectively. But navigating to his hunting area in an 18- to 20-foot open boat across large bays meant mooring the larger boat several hundred to 1,000 yards away, and then dragging or floating the pond boxes into the proper location for hunting. In the salt marsh areas and non-tidal areas of the islands within the marshes, standing water several inches deep is common. But a falling tide can leave little to no water in the marsh at the end of a hunt, requiring a lightweight blind that can be dragged or carried out of the marsh over the mud flats and marsh grass. "When possible, we prefer to float our blind out, walking slowly in knee-deep water with all of our gear stowed in our blinds," Evert said. "So, we not only needed a lightweight blind, it had to be easily grassed, set up easily in shallow water and easy to transport in our boats. There are no commercially available pond boxes or lay-down blind that exactly fit our needs, as far as we have been able to find. The boats made from the fiberglass molds in our area are not readily available and those that are available are very heavy." A few plastic models came close to filling Evert's needs, but did not work well because of a multitude of reasons, including size, shape and cost. Fold-up ground blinds would not work because they did not float and were also too expensive to leave in position for days at a time, imperiled by floods or by theft. "When I saw a two-person pedal boat lying upside down in the trash one day, I envisioned a two-person puddle tub," he said. "It's not that uncommon to see them in the trash, so anyone should be able to locate an abandoned pedal boat if they just keep looking for one. It appeared that the pedal boat was constructed of two molds: one for the hull and one for the topside. By separating the two, the hull mold (bottom section) would allow two hunters to lay down inside it and grass it up and the topside could be discarded." The first step in making the two-man puddle tub was separating the top and bottom molds by drilling out the aluminum rivets holding them together. In addition, staples holding the molds together were separated using a large flat wedge and hammer. Evert said the staples were neatly broken with the wedge one at a time simply by shifting the hammer strike and working the wedge along the line of staples. Once the bottom hull was opened up, it was checked for fit and size. The pedal boat Evert used is perfect for two hunters, each with his own gunning compartment. The middle hump, common to most pedal boats, was retained to separate the headrest areas. The hump also retained surface area to aid in multi-directional, camouflage grassing. The pedal assembly was removed. Then, a mounting bar was added for the backrests. A piece of 1¼-inch PVC pipe was inserted through holes cut through one side, then the hump area and out the other side. The PVC mounting bar was held in place with caps glued on the ends, which extended beyond the boat sides. A plywood backrest was added using U-clips fitted loosely around the PVC pipe, so the backrest could be rotated to a comfortable angle and to allow personal gear to be stored and retrieved. Cushions were added to the backrest and floor for comfort. A canopy made of coated wire fencing, is held in place by a piece of wood bolted to the hull, sandwiching the fencing between the wood and the hull. Wire ties hold grass bundles in place along the canopy fencing for camouflage. The flange around the edge of the hull was parallel to the water or ground on which the boat was resting. Evert decided an angled surface was needed to add camouflaging grass, so he heated the flanged edge gently and bent it downward to the appropriate angle. The added grass stands nearly vertical, but leans slightly inward to hide the hunters. Using black bungee cords, Evert attached 20- to 36-inch grass bundles. Holes were drilled through the flange so the bungee cord could be woven through, creating elastic loops to hold grass. Additional holes in the flange allow the boat to be anchored with stakes. Grass was installed along the center hump. The hump also acts as an armrest and provides a flat surface to keep hunting gear readily at hand. Drain plugs in each compartment allow water elimination without having to flip the boat, which would dislodge the camouflaging grass. Paint and a towrope completed the project. The rope was bridled across the front using two tie points. A second rope was tied to the center of the bridled rope. When two hunters drag the boat, they grab the bridled rope. If the blind is being towed, it is towed with the single rope tied to the center of the bridled rope. Transforming the pedal boat toy to a working boat-blind took about 10 hours. The total cost was $35. "Most of the assorted parts to make the two-man puddle tub are lying around any hunter's garage," Evert said. "I can only assume that across most duck-laden areas of the country, pedal boats can be found abandoned from time to time as people clean up their summer lakes homes each spring. As we designed it, the puddle tub could be used in just about any lay-down and grass-up blind situation, including fields, flooded rice fields and marshes. It fits perfectly inside a pickup truck bed and also fits neatly inside almost any 18-foot or larger open boat. o hunters and towed behind a boat in calm waters. It works so well. We killed black ducks, mallards, shovelers and geese out of the two-person puddle tub on Thanksgiving 2008." Cole Brown, 51, of Vermilion, Ohio, has been hunting for 39 years. The habitat he hunts along the southern shoreline of Lake Erie varies from marshes to river bottomland to cornfields. He and his fellow hunters needed a blind that could be used for all of those hunting situations. "The goal became designing a one-man blind that could be used in shallow water on dry land," Brown said. "It had to be portable, lightweight and had to set up in minutes. I have had the displeasure of hunting out of some pretty cramped and miserable blinds, so comfort was also a major consideration in the design process. The blind also needed to be able to withstand all the punishment to which hunting equipment is subjected, and I wanted to keep construction costs under $100. 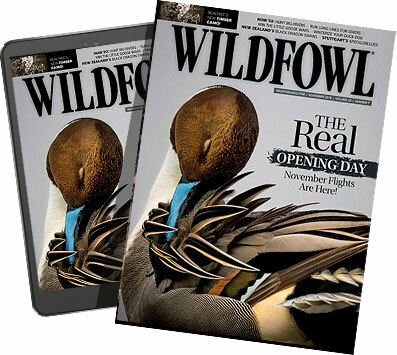 I needed complete concealment from wary mallards and the ability to shoot 360 degrees to accommodate all wind directions." The result is the Brown Buster Duck Blind, which has a 3-foot-by-3-foot-by-3-foot frame and is constructed of 1½-inch PVC pipe, 2-inch PVC pipe and fittings. Threaded adapters allow the legs to detach. The two lids fly open with the assistance of four bungee cords. "There is a 10-inch opening between the two lids when they are closed that allows for an unobstructed view in all directions, but provides great concealment from birds flying overhead," Brown said. "The dimensions accommodate one hunter, a dog and a standard-height marsh stool. There are several features that make this blind unique." The base frame is made of 1½-inch PVC. The lids are made of 2-inch PVC. A section of 1½-inch PVC fits inside each lid frame, allowing the lids to rotate. The bungee cords are custom cut to length. They are permanently looped around the lid frames and have S-hooks that fit into pre-drilled holes in the bottom of each leg. Once the bungee cords are connected to the legs, the tension springs the lids open. Short lengths of Nylon rope tied to the lid and sides of the top main frame prevent the lids from opening too wide. The bungee cords serve a secondary purpose by securing the legs and camouflage material to the blind during transportation. The legs have a threaded male fitting that enables them to be attached to corresponding female fittings on the top section of the blind frame. The weight of the finished blind is less than 40 pounds, including four grass mats (Cabela's Northern Flight Marsh Grass). It folds neatly into a compact package, so storage is easy even in small vehicles and out-of-the way corners of a garage or storage shed. The Brown Buster can be assembled in a couple of hours, and it sets up and takes down in seconds. "I constructed three Brown Buster Blinds for myself and two hunting partners," Brown said. "They were used during the entire 2008 waterfowl season and exceeded our expectations. Concealment in the marsh we hunt was always an issue, but the Brown Buster solved that. The uses for this blind seem unlimited." A true waterfowl hunter sees the utility of adapting any hull to fit the field conditions he faces each season. While most any boat can be transformed into some sort of duck craft, Charlie Speller of Raleigh, N.C., discovered an unused sailboat had the perfect lines for a sneakboat. The sailboat was less than 11 feet long, with a 40-inch beam and a gunwale 18 inches high. "My one-man sneakboat was built by using a discarded Sea Snark sailboat hull as its base," Speller said. "Last fall, we rented our home at Topsail Beach, N.C., for a full year. The Sea Snark had been lying in the garage for the last three years, and we had never used it much since acquiring the boat more than 20 years ago." The garage had to be cleaned for the new tenants, so Speller decided to begin the boat transformation process. He removed the existing rudder bracket and sealed the dagger board slot with a piece of plastic cut to fit the hole, fixing it in place with 5200 marine adhesive. "At that point, I began building a frame inside the bottom of the boat," he said. "I used 1-inch-by-4-inch cedar plank for its lightness and flexibility. I secured the planks along the inside rails of the hull and stern with ¼-inch-by-4-inch carriage bolts. The planks ran the entire length of the boat up to the bow under the old masthead bench. They were secured in that section by screwing the planks into the masthead bench at the front and having the carriage bolts extend through the sides of the hull, which hold the planks tightly along the entire length of the boat. It resulted in an A-frame of cedar planking to work from." The cedar A-frame, since it was integral to the hull, provided a solid framework for building the remaining framing and upper structure. Speller cut several cross members to shape and bolted them into place with steel angle, with structural grade glue added to further strengthen the hull framing. This helped provide an extremely secure base for the decking. Prior to enclosing the cockpit with decking, Speller studied the interior. He came up plans for the interior details, including wiring, connections and future access ports. "For the transom area, I used the original holes from which the rudder bracket had been disconnected and built a raised transom by installing two pieces of oak planking that had been glued and clamped together to provide a solid base for attaching a trolling motor," he said. "The oak planking was secured with ¼-inch-by-4-inch carriage bolts extending through the wood, through the hull and sealed with 5200 marine adhesive." After the framework was completed, Speller installed a piece of 1-inch PVC pipe along one side as a wiring conduit for running lights and a trolling motor. He installed a battery near the front center of the hull for balance. A permanent female connector provides trolling motor power. The top decking was made by covering the framework with ¼-inch marine-grade plywood in the rear and Luan plywood in the front. The use of the different plywood keeps the boat balanced and reduces total weight. Decking was glued and screwed into place with brass screws. A 12-inch-by-16-inch waterproof hatch installed in the bow decking allows access to the battery box. Because the top decking was bowed, additional fitting of the hatch was necessary. The battery is secured in a plastic battery box strapped to the framework. "Then I built out the cockpit area and raised the sides of the rear portion with additional 1-inch-by-4-inch cedar planks to make the sides higher for more draft in the event I encountered some rough water," Speller said. "All of the sections were sealed with waterproof calking and glued and screwed to the framework." pcoat was added using flat, oil-based paints. Speller added a locking cockpit cover for travel, storage and rainy conditions. He added a simple backrest that can be adjusted for shooting from a sitting position or laid down for true sneakboat hunting or layout hunting when anchored inside a decoy spread. A circular 8-inch hatch in the bow deck aids storage of an anchor and other gear. The hatch also allows access for the front running light connection. Additional accessories consists of a fire extinguisher in the cockpit, bow and stern cleats, compass and dashboard, mounts to hold the rear running light when its not in use and a kayak paddle and push pole mounted to the deck with clamps and bungee cords. The finished craft weighs less than 100 pounds. The makeover cost $550. The motor is a 55-pound-thrust MinnKota trolling motor with a handle extension. Top speed is 4 mph. The battery is an 875-amp model, providing four to five miles of range depending on temperature, wind and current. "The Sea Snark is now a sneak boat that has exceeded my expectations," Speller said. "It now functions as a boat, boat blind and land blind, which is much more useful than it was when it was a sailboat sitting in the way inside a garage."